The third Thursday of November was designated the Great American Smokeout back in 1976. Since then it has gained national attention and helped precipitate smoke-free policies in public spaces and workplaces. It is a day to commit to quitting smoking with the theory that if you can last one day without lighting up, then you can last a lifetime. Efforts to end tobacco consumption have a long history. Cigarettes grew in popularity during the 1850s, in tandem with the rise of Antitobaccoism movement.1 This movement was taken on by Seventh-day Adventists, whose most outspoken figure was Dr. John Harvey Kellogg. 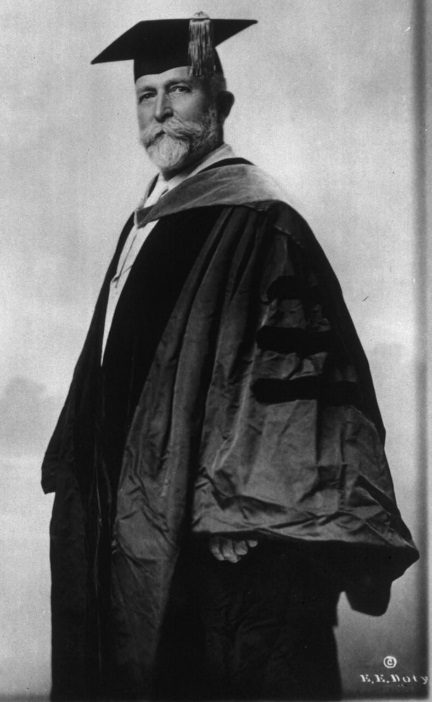 John Harvey Kellogg, MD (1852– 1943). E. E. Doty, photographer. Source. 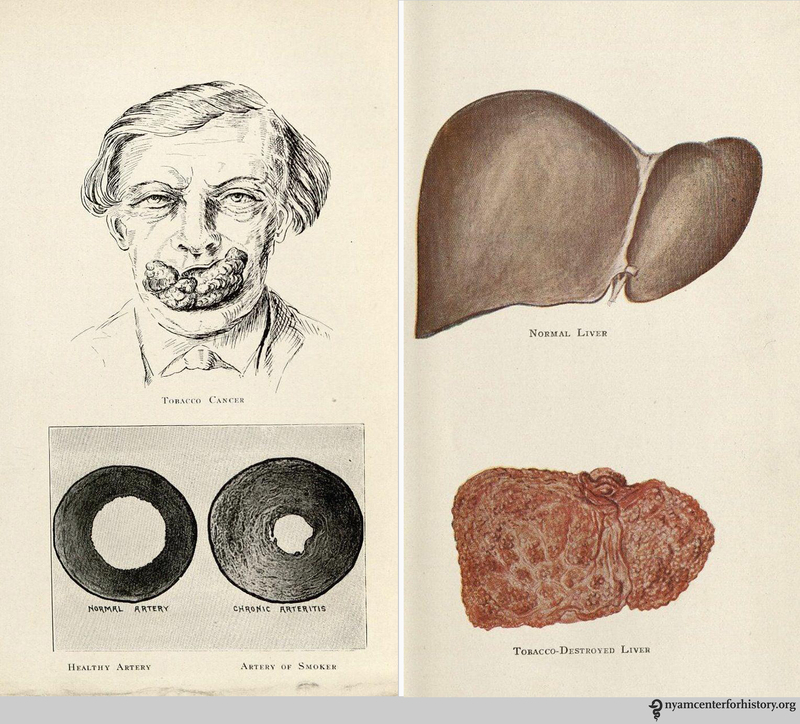 Prints and Photographs Collection, History of Medicine Division, National Library of Medicine. The Adventists believed in a healthful lifestyle, including abstinence from coffee, alcohol, tea, and tobacco. Kellogg termed this “biologic living.”2 He and his compatriots established the American Health and Temperance Association in 1878 to expose the health risks of tobacco and other stimulants. Later, he became a member of the Committee of Fifty to Study the Tobacco Problem, presumably established after the First World War, when a “condition known as ‘soldiers’ heart’” affected British veterans.3 Kellogg also established a hydrotherapy sanitarium and wrote numerous books on healthful living. Today he is best remembered as the co-founder of Kellogg’s, a cereal company that grew out of his sanitarium’s dietary work. Kellogg, John Harvey. Tobaccoism, or How Tobacco Kills. Battle Creek, MI: Modern Medicine Publishing; 1922. According to Kellogg, this meant there were 460 cigarettes for every man, woman, and child, a disturbing “rapidity in the spread of a disease-producing vice.”5 He wrote Tobaccoism in part to slow this growth by making sure people understood that tobacco was harmful and its effects irreversible. There’s no better time to quit smoking than right now. 1. Reducing Tobacco Use. Centers for Disease Control and Prevention; 2000. Available at: http://www.cdc.gov/tobacco/data_statistics/sgr/2000/complete_report/pdfs/chapter2.pdf. 2. Marino RV. Tobaccoism revisited. J Am Osteopath Assoc 2003;103(3):120-121. 3 Lock, S. (ed. ), Reynolds, L.A. (ed. ), Tansey, E.M. (ed.). Ashes to Ashes: The History of Smoking and Health. Amsterdam: Rodopi; 1998. 4. Fee, Elizabeth, Brown, Theodore M. John Harvey Kellogg, MD: Health Reformer and Antismoking Crusader. American journal of public health 2002;92(6):935. Available at: http://www.ncbi.nlm.nih.gov/pmc/articles/PMC1447485/pdf/0920935.pdf. 5. Kellogg, John Harvey. Tobaccoism or How Tobacco Kills. Battle Creek, MI: Modern Medicine Publishing; 1922. 6. Broken Promises to Our Children: The 1998 State Tobacco Settlement Fifteen Years Later. Washington, DC: Tobacco-Free Kids; 2013:87. Available at: http://www.tobaccofreekids.org/content/what_we_do/state_local_issues/settlement/FY2014/StateSettlementReport_FY2014.pdf. 7. U.S. Centers for Disease Control and Prevention. Economic Facts About U.S. Tobacco Production and Use. Smoking and Tobacco Use 2014. Available at: http://www.cdc.gov/tobacco/data_statistics/fact_sheets/economics/econ_facts/index.htm#sales. This entry was posted in Collections, History of medicine and tagged Great American Smokeout, John Harvey Kellogg, smoking, tobacco, Tobaccoism or How Tobacco Kills by nyamhistorymed. Bookmark the permalink. My latest post from nyamcenterforhistory.org. For more on the health crusades of Dr. Kellogg, check out the new book, “Dr. John Harvey Kellogg and the Religion of Biologic Living” by Brian C. Wilson (Indiana University Press, 2014).